Marty Walsh needs to unkiss the Blarney Stone. 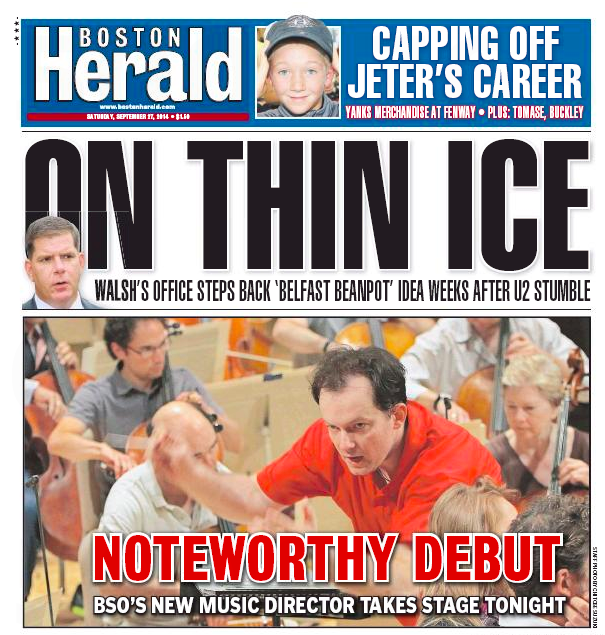 On his trip to the Ould Sod, Boston’s mayor has gotten shamrocks in his eyes for the second time in as many weeks, earning him the top half of today’s Boston Herald. 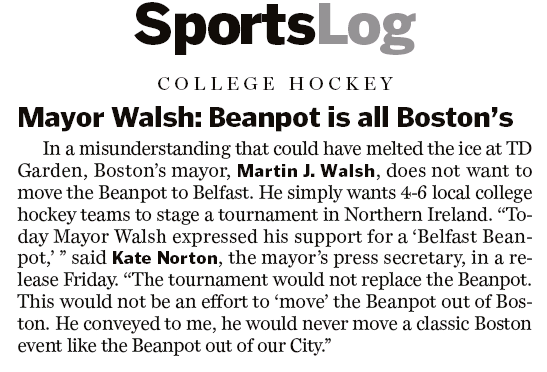 Mayor Martin J. Walsh was forced to walk back yet another off-the-cuff statement, this time after a firestorm set off by his bizarre proposal to play the Beanpot hockey tournament in Belfast — the mayor’s second gaffe in two weeks that has PR experts urging his handlers to rein him in. The Beanpot Tournament is a 62-year-old Boston tradition in which Harvard University, Boston College, Boston University and Northeastern University hockey teams compete for Hub bragging rights. That got the Twitterati’s Irish up, but not so much at the Boston Globe, which tucked the rumpus into the SportsLog section. Now we know – it’s possible to moonwalk on ice. This entry was posted on Saturday, September 27th, 2014 at 12:40 pm and is filed under Uncategorized. You can follow any responses to this entry through the RSS 2.0 feed. You can leave a response, or trackback from your own site.